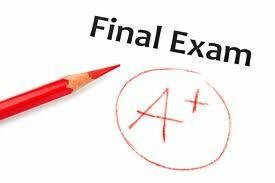 Final exams will be given on December 18th for 1st and 2nd block and December 19th for 3rd and 4th block classes. No final exams will be given early. Students who have an excused absence on December 18th may make up their final exam on December 19th. Students with with excused absences during finals may be required to take a make up final on teacher inservice (January 3rd/4th) or after school in January. Students who are absent from finals will be given an incomplete for the course until final is made up. For students excused as absent, then umber od days allowed to make up finals will be equal to the number of days absent. For example: two days absent = two days to complete make up finals. Students may be exempt from final exams based on their grade in the course and the number of absences. Students who are failing a course may not exempt final exams. Excused absences do not count against final exam exemptions. Students who are exempt are not required to attend school on exam days. However, students who are exempt and attend school must go to their scheduled classes. Students who bring in their signed permission form may check themselves out of school after they take final exams. Students will give their signed form to their teacher and sign themselves out. Students are then free to leave school. Students may not leave until the end of the class period. We do not accept phone, fax, note or email checkouts on final exams days. Parents may check out students in person on these days. Exams will be completed by 11:15 am each day. In order to avoid disrupting students who are taking final exams, students will only be called for dismissal between classes. Students who ride a bus home from school will have to stay until buses run on their normal schedule at 3:25 pm. These students will go to the gym or the theater after lunch. Teachers will let students know their exemption status several days before final exams. Exemption status is based on the grade average and number of unexcused absence for each class.